The terms amateur, enthusiast, citizen, recreational and hobby microscopy all mean the same. While the word “amateur” originally comes from the Latin word for “lover” (ie. the lover of an activity), it has, unfortunately, obtained somewhat negative associations. Often amateurs are considered to be less capable, knowledgeable and competent than the “professionals” , who use microscopes to earn a living. But just because someone does not use microscopes to earn a living does not mean that these individuals are more or less capable than the “pros”. Professional microscope users such as researchers often use the microscopes for highly specific tasks and therefore often require highly specialized and expensive equipment to solve specific research problems. This does not mean, however, that amateur microscopists are automatically more or less competent in their field of interest than their professional counterparts. In order to avoid the negative connotation of the word “amateur”, other terms have been proposed, including enthusiast microscopy, citizen microscopy, recreational microscopy and hobby microscopy. Throughout this book I am using the term “amateur microscopy”. I am doing this because I want to contribute to the changing of the sometimes negative associations that accompany this word. By simply avoiding the term, one does not change its meaning. Personal opinion. Maple leaf veins after the removal of the soft tissue. 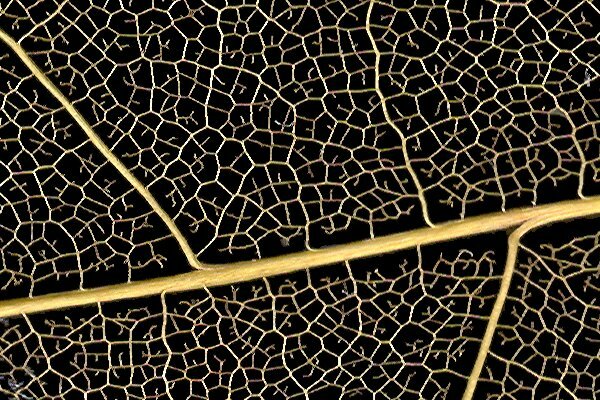 The leaf was dried and then scanned at high resolution.